Looking back on the period between 1965 and 1975, this nation found itself in the midst of a social and cultural revolution. It was during this same time that the female staff of Newsweek magazine began to realize that it was time to take their (white) gloves off. The “revolt” started at Newsweek in March of 1970. The magazine’s cover story, “Women in Revolt,” featured the feminist movement. The author of the cover story was not a member of the Newsweek staff, but a freelance writer. Newsweek did not have female writers or reporters. Instead, women stagnated in dead-end jobs as fact-checkers or researchers. On the same day, 46 female employees filed a complaint with the EEOC against the magazine on the grounds of sexual discrimination. Members of management were horrified. Female staff knew that anything less than a lawsuit would only lead to empty promises. It is important to realize these women prided themselves on the norms of the day: white gloves and unquestioning compliance. All were confused and conflicted about going against management, but felt they had no choice. The group forged ahead without knowing the consequences. They were more aware of the consequences of not filing. The environment was one of continuous sexist bantering—always followed by a laugh. The magazine was a revolving door for women with a writer’s ambition. (Nora Ephron, Ellen Goodman, Jane Bryant-Quinn, and Susan Brownmiller all left Newsweek to become successful writers elsewhere.) Those who did not leave realized they would either have to fight for their rights or go nowhere on the career ladder, supporting the status quo. Following the lawsuit, there were token concessions and many broken promises. Some who tasted victory backed away when given the opportunity to prove themselves; others rose to the challenge, fighting subjective evaluators and stereotypes. All experienced ambivalence. By March 1971, it was clear that management wasn’t living up to the spirit or the letter of the 1970 agreement. Enter Harriet Rabb of the Columbia Law School Clinic on Employment Rights, who agreed to represent the group. On the second round, anger replaced ambivalence. With news of a second complaint in the works, a flurry of hirings occurred. In June 1973, management signed a memo of understanding including goals and numbers. The fever of feminism spread to Reader's Digest and the New York Times. Between 1975 and 1985, women pushed into every position on the magazine except top management. Sexist adjectives had long disappeared from stories and women’s bylines became prominent; however, some of those victories were hard won. Lucy Howard worked as a reporter but was paid as a researcher. After demonstrating that she had not checked a story for more than six months, she was promoted. Ms. Povich became the magazine’s first senior editor, only to learn that a male promoted at the same time earned $8,000 more than she did. She had the courage to refuse the promotion until the equal pay for equal work issue was resolved. Eleanor Clift, working in the Atlanta Bureau was the first female reporter to cover the president in the West Wing during the Carter administration. The above illustrate only a few examples of significant progress gained by many individual struggles and the original “revolt.” Still, almost 40 years after the original complaint was filed, current employees Jessica Bennett and Jesse Ellison co-wrote an article entitled, “Are We There Yet?” They documented that while there is progress, the demographics still do not add up either salary-wise or on the masthead. The epilogue lists some of the key players and where they are today. Some rose to great heights; others have faded into the background, citing their role in the lawsuit as the highlight of their careers. Still others confess to regrets and unrealized ambitions. This story is not just a Who’s Who of feminist achievement, but an honest portrayal of the battles of a few meant to benefit not only themselves but those who came after them. 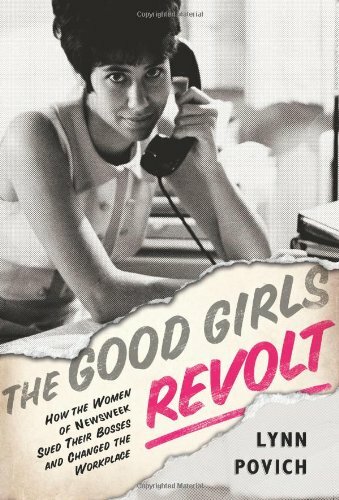 The Good Girls Revolt: How the Women of Newsweek Sued their Bosses and Changed the Workplace is a book that needed to be written. Those of us who came of age during those years can relate to the courage it took to fight for equality. Young women of today will benefit from being reminded about what it took to secure their places in today’s workplace and far beyond.